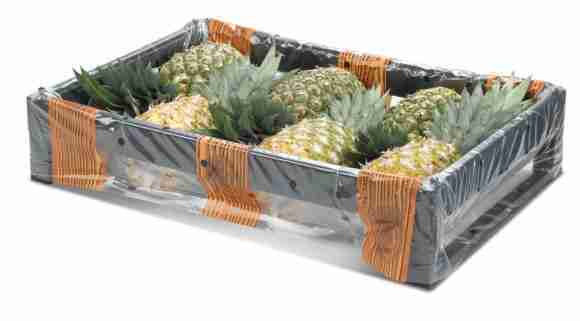 IRVINE, CA: EcoPack Systems, a groundbreaking maker of transport packaging, has started production of the EcoPack Pineapple Crate at locations in Costa Rica and California to support growing demand from suppliers in Central America and the Western United States. The new crates, the latest innovations from EcoPack, feature fully customizable point of purchase branding, dramatically reduce transportation costs and are made from food grade material. “EcoPack is on the leading edge of packaging solutions and this new container will help keep them there by addressing several pain points produce growers and their retail and foodservice customers are encountering. These challenges include food safety and sustainability as well as supply chain performance and efficiency,” said Jeffrey Racoosin, Vice President Sales and Marketing at TNT Plastic Moldings, EcoPack’s crate production partner based in Corona, CA. The patented EcoPack system consists of a plastic frame and hygienic plastic bag that together create an economical, multipurpose, recyclable crate. The frame has the same dimensions as standard paperboard cartons and plastic crates and is suitable for palletizing. The bags are customized for specific commodity and product applications and designed for optimal ventilation, food safety and waste reduction. There are currently multiple sizes with three base dimensions at several heights, plus a unique crate for bananas. “The new EcoPack Pineapple Crate creates an advantage for both suppliers and retailers by providing the many financial, hygiene-related and marketing benefits of all our containers with specific design elements created to ensure less damage of the fruit in transit. The response has been overwhelmingly positive and we’re already looking to develop similar solutions for other commodities,” said Danny Bartal, CEO of EcoPack Systems. Founded in 2008, EcoPack Systems is a privately held company that markets a unique, patented container solution to the extended retail supply chain. The solution offers users cleaner, greener and healthier transportation of fresh and processed foods at a reduced cost. More information on EcoPack Systems is available at http://www.ecopack-greenbox.com.